On Monday, we examined this year's AL free agent arbitration decisions. Today, let's shift our focus to the Senior Circuit and revisit the 12 National Leaguers who declined their teams' offers of arbitration in November. Players who decline arbitration forfeit the chance to settle on one-year deals with their former clubs through the arbitration process. Frank Francisco and Jason Frasor chose their teams' offers over free agency and will now work toward deals with the Rangers and Blue Jays, respectively. Players who accept arbitration don't get guaranteed raises, but those who go through the arbitration process rarely take significant pay cuts. 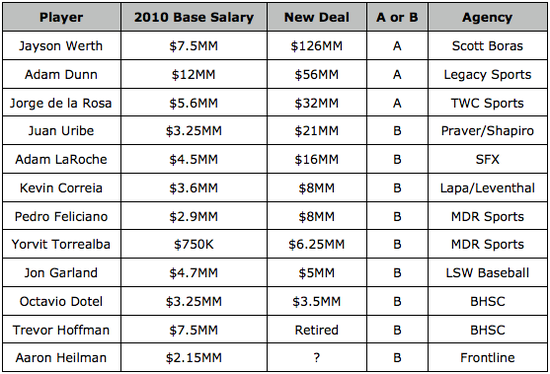 The chart below shows players' 2010 salaries and whether the player signed a new deal or remains on the open market. The players above would generally have obtained far smaller guarantees by accepting arbitration, so it's understandable that the players and their agents turned down the teams' offers. Garland and Dotel might have obtained comparable money by accepting arbitration, but Garland wanted to return to the Dodgers and Dotel has a better chance of closing in Toronto than in Colorado. If Heilman can find himself a raise this offseason, every National League player who declined arbitration will have found a comparable or superior deal on the open market*. *Hoffman agreed to turn the Brewers' offer down; he did not have the choice of accepting. Where it says “New Deal” for Aaron Heilman, it should say “Retired”.